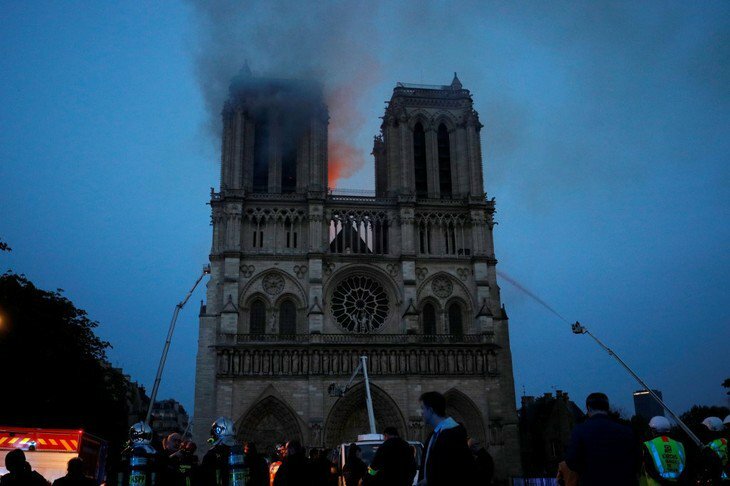 After a more than 12-hour battle involving 400 firefighters, the devastating fire that began on Monday afternoon, destroying the roof of 850-year-old UNESCO world heritage landmark, Notre Dame Cathedral in Paris, France, was extinguished on Tuesday morning. The cathedral’s two 69-metre bell towers remain intact, but the spire and roof have been lost. Notre Dame’s spectacular Gothic spire collapsed before the eyes of horrified onlookers. The cause of the fire is not clear. An investigation has been opened, but officials think it was an accident, possibly as a result of restoration work taking place. Fire officers saved a number of treasures inside the cathedral, including religious relics and smaller works of art. Some key artefacts might have been lost, however. As well as damage from the heat, experts also need to assess damage from the vast quantities of water firefighters poured into the cathedral. French President Emmanuel Macron has pledged to rebuild the cathedral, which he called “a part of us”, and appealed for help to do so. Two of the country’s richest tycoons – François Pinault and Bernard Arnault – have pledged millions to the restoration fund. Experts and architects met to assess the damage and establish whether the historic monument was stable. Investigators were also keen to examine the building to establish the cause of the blaze. The Paris prosecutor has opened an inquiry into “involuntary destruction by fire”. Officers will want to question teams of workers carrying out renovations on the cathedral when the fire broke out, The Guardian of London reports.